In my Chilean Culture class we have been learning about the street art/graffiti that decorates (while conveying a message) the streets and buildings throughout Valparaíso. We had the opportunity to listen to Charquipunk, a well-known graffiti-artist here in Valparaíso, talk about his art and the history of graffiti in Chile. 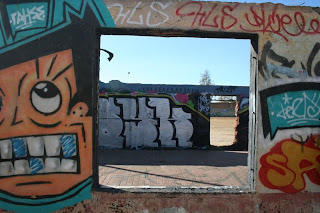 Then, on Thursday (May 14) we took a field trip to the Ex-Carcel that has been turned into a place where artists are free to express themselves all over the walls, displaying different murals. The Ex-Carcel is an old prison in Valpo where prisoners were jailed for many years. Here we met an ex-prisoner, who now works at the Ex-Carcel as a volunteer sharing his experience. His story was very interesting since he had been imprisoned for 13 years and at one point he had escaped. He described how him and 11 guys dug a giant hole that took 5 months to dig. He had escaped through the hole and was free for 3 months until they found him. I thought it was really neat to be given a tour by an ex-prisoner and to understand the experiences there through his own account. To see the work of Charquipunk click here. And to see photos that I took at the Ex-Carcel, visit my photo website.